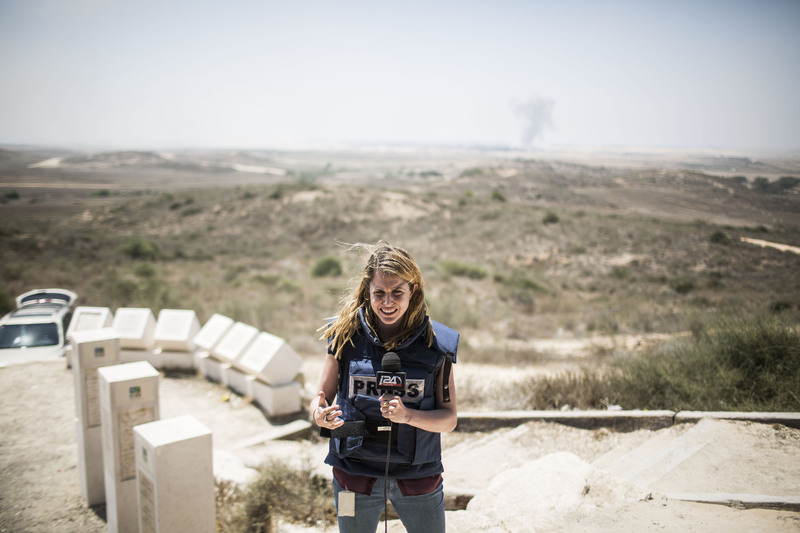 With The Death of James Foley, Why Do Foreign Reporters Take The Risk? The country is still reeling from the tragic death of James Foley, a photojournalist working for GlobalPost in Syria who was beheaded by an ISIS operative. Before the video of his execution was released on YouTube last Tuesday, Foley had been missing since November 2012, after armed assailants forced him out out of his car and abducted him in Northwest Syria. Foley was also imprisoned in Libya in 2011 for six weeks after Ghaddafi supporters kidnapped him, along with several other journalists. Since his execution became public on Aug. 19, a national conversation has been ignited about his life's professional passion: foreign reporting. Journalists have been reporting internationally for years, but recent events are a clear reminder that the profession doesn't come without its fair share of serious risks. Is it worth it? Foreign correspondents and foreign desks for major news organizations were the status quo for years, but times have changed since media was a bloated industry. As traditional foreign desks close due to budget cuts, more freelance or alternative foreign reporting appears to be taking their place — along with more journalist-targeted violence, which is even more terrifying for reporters who aren't attached to media organizations with established protections. 69 journalists — not including Foley — have lost their lives covering the conflict in Syria. Since 1992, 1,072 journalists have lost their lives. In the last 10 years, over 600 journalists have been killed. According to a statement released last week by the Committee to Protect Journalists, 69 journalists — not including Foley — have lost their lives covering the conflict in Syria. Since 1992, 1,072 journalists have lost their lives. In the last 10 years, over 600 journalists have been killed. Still, these troubling figures didn't seem to hold back James Foley. While some might be shocked Foley would continue to report from a war zone after his first imprisonment in 2011, Jack Doppelt, a journalism professor at Northwestern's Medill Journalism School — where James Foley earned his journalism degree — tells Bustle he sees a "phenomenon" of young journalists like Foley who are "seeking global engagement in remote places — some of which are in really tricky areas," regardless of whether or not they're attached to a corporation. While Doppelt did not teach Foley personally, he adds that "Jim was of a very unique people" willing to take the risk. But, at this point, some are asking: Does the risk pay off, particularly when safety continues to be more and more of an issue for journalists hoping to report freely abroad? In an article published Aug. 20, Newsweek's Janine di Giovanni asks: "Is James Foley's Death the End of Frontline Reporting?" Journalism has been called “the first draft of history.” But how can a first draft be recorded when we are not allowed to do our job? Foley’s work had concentrated on the civilian suffering, in places like Aleppo where the suffering is paramount. How can we tell the story if we are now the targets? "It's never been more dangerous to be a journalist abroad." Ed Kashi, an award-winning photojournalist who's worked in places like Spain, Syria, Iraq, and Pakistan, tells Bustle. "We are now targets of opportunity or violence, and not perceived as neutral observers. Often [we're] treated like spies. I have had to curtail the places I'm willing to work and the kinds of stories I do." Kashi says he was detained in Nigeria for four days and dealt with some "close calls" in Iraq. Though Kashi says he has been "at risk many times," he doesn't question working as a photojournalist. "But I have had to make personal choices about the level of risk I'm willing to take on," he says. Besides growing safety concerns, there is other evidence of a transformative moment occurring within in the profession of foreign reporting — mainly, fewer foreign desks and more freelances. According to a 2011 American Journalism Review census, the number of foreign journalists employed by 10 U.S. newspapers and one chain was 234, compared to 307 just eight years previous. According to Pew Research Center, at least 20 newspapers have reduced their foreign coverage. Producers and network executives believe the American mass audience's interest in daily events beyond their nation's borders is declining, so little such news is offered - which exacerbates the high cost/low return (or low visibility) nature of international coverage today. "[There] may not be a long-term future in [reporters] placing themselves in these locations to work for news organizations," says Doppelt. But he cites many international networks, like Reuters and Al Jazeera, and international human rights organizations, like Human Rights Watch, as examples of sources that continue to provide extensive international coverage. Freelance journalists reporting abroad, on the other hand, have taken coverage into their own hands. As public radio station WBRU puts it, "A growing number of those journalists essentially work for themselves and are responsible for their own protection." The competition for paid bylines is fierce, as is the incentive to take risks. ...sleeping in this rebel base, under mortar fire, on a mattress on the ground, with yellow water that gave me typhoid, costs $50 per night; a car costs $250 per day. So you end up maximizing, rather than minimizing, the risks. Not only can you not afford insurance—it’s almost $1,000 a month—but you cannot afford a fixer or a translator. You find yourself alone in the unknown. The editors are well aware that $70 a piece pushes you to save on everything. Within more traditional models of foreign reporting, large news organizations pay for heightened security measures and their reporter's insurance. GlobalPost — Foley's former employer — has both staff writers and freelancers. GlobalPost's co-founder told WBRU they "do have kidnap and ransom insurance." But those jobs are few and far between. But we’re war reporters, after all, aren’t we? A band of brothers (and sisters). We risk our lives to give voice to the voiceless. We have seen things most people will never see. We are a wealth of stories at the dinner table, the cool guests who everyone wants to invite. But the dirty secret is that instead of being united, we are our own worst enemies; and the reason for the $70 per piece isn’t that there isn’t any money ... The true reason is that you ask for $100 and somebody else is ready to do it for $70. This much is clear: Although the media landscape is changing, there will always be those, like Foley, who believe in the importance of this work, no matter the danger.